A wealthy Brazilian industrialist is nearly undone at the disappearance of his only daughter and heir to the family business. Quietly so as not to alert outsiders and other corporate predators, Thiago hires the world's most elite information-gathering unit, the R-Group to locate and return his daughter. Though the path to finding the heiress is dangerous and the fear is that finding her won't mean all is well. The team in Switzerland follows the leads from South America to Mexico and the Caribbean, but the data trail is leading nowhere. Sometimes the most important clues come from unlikely places. Two members of the elite team, Petra and Jacob, while vacationing in Mexico cross paths with Carlos and Juan's fly-by-night operation. The Bad Boys are cloaking their "moving business" from satellite surveillance as they execute their legendary yet unique business model for relocating drug lords along with their cash, gold, artwork and other assets, targeted by the Mexican authorities. Business is so good. Carlos and Juan, so-called entrepreneurs, who even the most generous observer would question the legality of their business model. The trouble is, success always breeds unwanted attention. With these very different issues, the R-Group is busy assembling the pieces of the puzzles without creating international consequences. The open questions include: Can the brothers stop running outside the law long enough to do the right thing? Is it possible to you hide from your past and still enjoy the present? Is the heiress hiding in plain site or gone forever? And can the brothers rein in their contempt for societal rules and leave behind the sweet deals long enough to save a life? 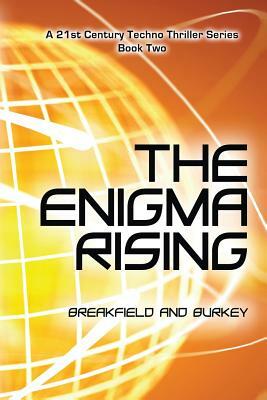 The Enigma Rising, Book 2, continues the award winning Breakfield and Burkey's The Enigma Series. This story focuses on overcoming opportunistic cyber-crime in the high-stakes world of information brokering in today's 21st century. With its strong cast of characters, The Enigma Rising continues the use of a relevant technology foundation weaving in mystery, intrigue, romance, humor, and ethics as the team track the lost and found, and lost again, to take you on an incredible journey into the cyber dark side.